Remember the first time you rode a bike? Your first car? Your first kiss? The first time you do something is a powerful experience. It marks the beginning of something fresh and exciting, yet more than a little scary. This fear is the reason so many of us struggle with starting a YouTube channel, even though marketing statistics firmly suggest that video will play an increasingly key role in digital marketing over the next few years. A wise man once said that “a journey of a thousand miles begins with a single step.” You may not have realized it, but you’re taking that step right now: in this post, we’re looking at the first videos of successful YouTube channels to help you with ideas for your first YouTube video. What better way to get some inspiration for this momentous occasion than a short trip down memory lane? Uploaded by YouTube co-founder Jawed Karim, Me at the zoo was the very first video ever published on YouTube. At just 18 seconds long, it’s short, sweet, and shot at the San Diego Zoo by a friend of Karim’s. The oldest video on YouTube, the platform that would ultimately go on to change the way we consume video, was perfectly imperfect. There were no fancy film crews. No editing. No hair and makeup. Just a guy, talking about elephants. Twelve years later, YouTube has over one billion users, reaches more 18-49 year olds in the US than cable networks, and can be accessed in 76 different languages! People from all over the world, with different interests and passions, have used YouTube to grow careers, find their communities, and create phenomenal content. And it all started with one simple video. 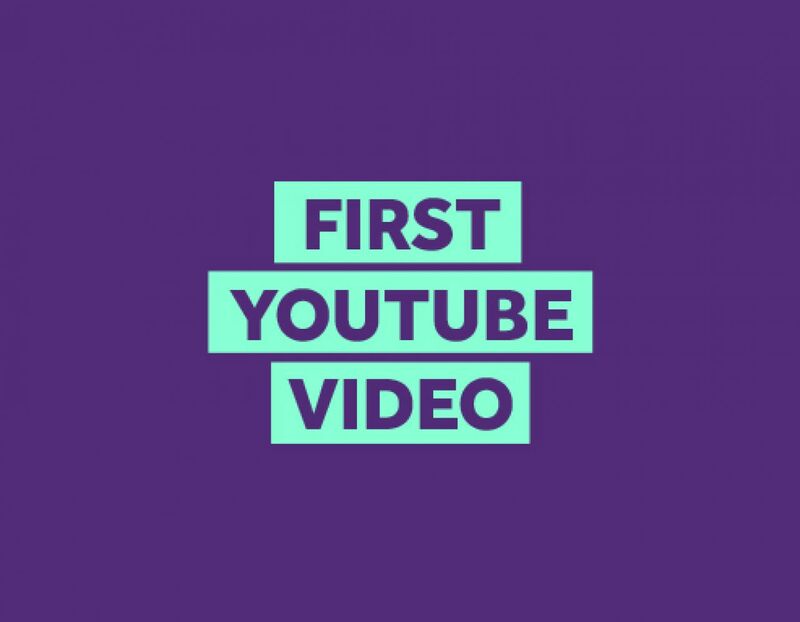 So what about your first video? How can you start your channel with a bang? Let’s take a look at a few different styles of video. You don’t have to spend hours and hours planning your first video. It can really be as simple as sitting in front of the camera and telling people a bit more about yourself and your business. That’s exactly what Brian Halligan, co-founder of HubSpot, did for their first YouTube video. Sitting in a (badly lit) chair, Halligan talks directly to the camera and tells us a bit more about how and why HubSpot came to be. It’s simple, personal, and it works. If you’ve been sweating your first YouTube video for months, looking for ideas, trying to draft out a script, and scraping together a fancy special effects budget, stop. Sit down somewhere comfortable, get some decent lights, and tell us about yourself. Want to introduce your company, but aren’t sure about sitting in front of the camera? We’ve got you covered. Just use one of our business templates to create a quick, professional video, and tell the world about yourself. You can customize your video by uploading your own footage or by adding a voiceover. We go to YouTube to look for answers to important questions. So what better way to start your new channel than to answer a question? That’s what content marketing is all about, right!? Unbounce picked a question that bugged their ideal user, and answered it using a short explainer video. This is a great way to start a conversation and attract new viewers. Creating an effective explainer video with one of our templates is ridiculously easy. Look through your FAQs or speak to your sales and customer support teams and pick a question that comes up a lot. Choose your favorite explainer video template. Create a short video that answers the question thoroughly and succinctly. Upload your video to YouTube, optimize it, and watch it capture traffic. Do you love themes and long-running campaigns? You can be like Blendtec and start a YouTube series. A great idea that runs through your YouTube channel can help you stand out. What’s at the heart of your brand? How can you make something your product does funny or exciting to watch? Because if Blendtec can make a blender exciting, you can definitely do the same. There’s a lot of pressure to get things right first time. Let’s be honest: most of that pressure comes from you. You want to get your first YouTube video as near to perfect as possible. You’re worried that if you change direction later, you’ll be seen as a flake. Ramit Sethi from I Will Teach You To Be Rich started his YouTube channel before establishing his business. His first few videos were all about a product he used to make. Then, about twenty videos in, he pivoted. He began making short videos about making money. The videos were simple: Sethi just stood in front of the camera and talked for about 60 seconds. The point is that first videos will never be perfect. The fact is, they don’t need to be. As you make videos, you’ll learn new skills and keep on improving. The way you do things will change. Sethi’s videos today are nothing like those first ones, and yours won’t be either. As soon as you’ve got the first one out the way, you can go on to tackle some of the other YouTube video ideas in our ultimate list. If you keep waiting for the perfect idea or the right moment, you’ll never find it. The real secret to nailing your first YouTube video is to simply do it and keep on doing it. Me at the zoo was shot on a handheld camera with minimum editing, yet was the first shot in a creative revolution. It’s time to stop waiting and start your own.